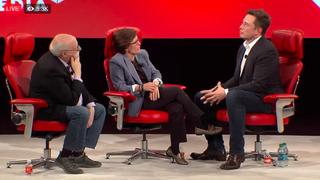 At the Code conference this evening, Elon Musk joined Walt Mossberg and Kara Swisher onstage to talk about his varied and eclectic pursuits. And when the talk turned to autonomous vehicles, Musk was sure to share his opinions on what he perceives to be Tesla’s biggest competition. Nope, not Google. Musk doesn’t consider Google’s self-driving car program to be a direct competitor with Tesla—“they’re not a car company.” But he did have some thoughts on Apple’s rumored vehicle, which he does see as a direct competitor. Nemesis, maybe? Like, smackdown parameters have now been drawn. Shoulda really gotten on this sooner, Jony! I mean is there anything worse than calling something a “missed opportunity” before it even exists? Speaking of opportunities, Musk is planning another Tesla event before the end of the year to specifically address autonomous technology, which he believes will be ready in two years. What exactly will he announce? “Let me just say we’re going to do the obvious thing.” And maybe work on that bus? You can watch the whole video for more Musk Thoughts™ on neural lace, production schedules, Hyperloop pod design, landing rockets on barges, going to Mars, battery factories, simulation talk in hot tubs, and his project to save the world from a dystopian AI future.